SpokenWord Paris is one pole of a nomadic tribe of people who love poetry, writing and song. A home for creatives and lost anglophones. We do an open mic night called SpokenWord every Monday au Chat Noir and an allied writers’ workshop at Shakespeare & Company (every Sunday.) We do a literary journal called The Bastille and Tightrope Books published many of us in the book “Strangers in Paris.” Click on the blue stamp on the right to sign up to the mailing list. Open mic/scène ouverte: Performance poetry. Lire vivant. Poésie sonore. Stand up. Monologue. Stories. Beat poetry. Spoken word. English. Français. Your own original texts. Old texts from Rimbaud to Dr Seuss, Beowulf to Gil Scott-Heron. Chacun a son mot à dire. Make the words come alive…………………….. Acoustic songs also welcome. Some podcasts from Monday nights au Chat Noir, by Victor. Listen or download here. Starts again 4th Sept. Then every Monday Au Chat Noir, 76 rue Jean-Pierre Timbaud 75011. Métro Parmentier/Couronnes. Sign up 8pm to 9.30pm in the bar. Poetics start from 8.30pm underground. Check out thePractical info page for more info. Paris’ biggest and longest-running English open mic night, started in 2006. All langues welcome. Entry one euro. AWOL Writers’ Group – free! 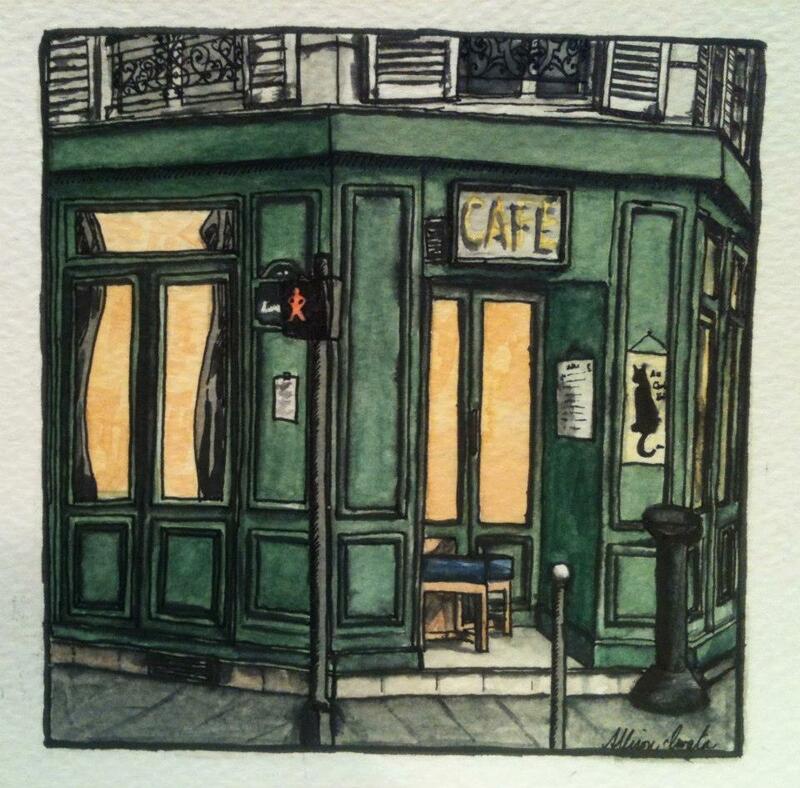 6.30pm-8.30pm every Sunday at Shakespeare & Company, 37 rue de la Bûcherie, 75005. Free. Bring your writing or just come and listen join the discussion. Hosted by Bruce Sherfield and Simon Millward. Description Join us afterwards for a drink. Chat Noir sketch drawn by Allison Iwata. The Flash Fiction Festival is almost here!